He's obsessed with numbers and execution. In other words, the HP CEO is the guy you want running a company in a recession. But is he a CEO for the ages? You Hurd it here first: HP's CEO may be one of the best managers in corporate America today. (From left) CIO Randy Mott, CFO Cathie Lesjak, General Counsel Michael Holston, Human Resources head Marcela Perez de Alonso, and Chief Administrative Officer Pete Bocian keep HP running on time. Hurd counts on (from left) Ann Livermore , head of HP?s business computing and services business, Todd Bradley, his top PC executive, and Vyomesh Joshi, head of printers, to deliver profits. Hurd, at an event for HP customers before the NBA All -Star game in Phoenix, regularly meets with clients. Fortune asked five chief executives whose companies made this year's Most Admired all-star list how they're managing in a recession, what keeps them up at night, and when they think the economy will get its groove back. (Fortune Magazine) -- When Mark Hurd is at home in California, he wakes up each day at 4:45 A.M. - without an alarm clock. The certitude that a competitor in the Eastern time zone is already trying to gain an upper hand - Hurd uses a mild expletive to suggest what rivals might be trying to do to him - drives him to pop out of bed unaided long before sunrise. Hurd's achievement was making that combination work with his mantra of efficiency, which makes it remarkable that he hasn't yet swung the machete for any economy-related layoffs. After all, one of Hurd's first acts as CEO, in flush times, was to whack 15,200 jobs - then 10% of the workforce. (Not that current employees won't feel some pain: Most HP workers, including Hurd, are taking a cut in base salaries.) "We think that eliminating talent and then quickly rehiring talent is an expensive and risky proposition," says Hurd, who doesn't rule out "workforce optimization" if the economy worsens but says he currently isn't planning any further job cuts. A master at slicing and dicing, and a peerless control freak, Hurd, 52, still hasn't proven himself as a builder, a rap he has faced from the moment he stabilized HP after about a year as CEO. HP was once among the most innovative of big tech companies. Today, with the exception of its printer group, a cash cow that has stopped growing, most of HP's hardware runs on standard technology. (Read: Microsoft software and Intel chips.) Over time this should lead to industry-average growth levels and profit margins that improve only if there remain costs to cut. This is in stark contrast to Palo Alto-based HP's neighbor, Apple (AAPL, Fortune 500) (No. 1 on the World's Most Admired list), which combines market-defining innovation with ultra-predictable operations. "The religion of efficiency has a dark, dark side," says Michael Tushman, a Harvard Business School professor whose research has quantified the shortcomings of stressing operations at the expense of innovation. "For too many general managers, the certainty of today trumps the uncertainty of the future." It's simplistic to think of Hurd as merely a cost cutter, but he's an unrepentant left-brainer. He personally maintains a spreadsheet that tracks and analyzes his daily tasks. That kind of obsessiveness makes him an ideal CEO for these tough times. His ability to draw out and encourage his company's right-brain tendencies, though, will determine if Hurd is a CEO for the ages. Hurd is proselytizing, the sermon of his choosing being operational efficiency. For a salesman, it is a holy day: the mid-February Sunday of the NBA All-Star Game at the U.S. Airways Center in Phoenix. It's an ideal opportunity to thank a baker's dozen of men responsible for company purchases from every corner of the HP empire. For now, the razzle-dazzle of slam dunks and celebrity sightings is several hours off, and Hurd is holed up for two hours with his customers in a windowless ballroom at a nearby resort. Hurd is showing them how to reinvent themselves the HP way. He explains to this group of executives, from giants like American Express and DirecTV to local small fry like direct-mail printer AmazingMail.com, a buyer of HP's graphic printing presses, that HP has slashed the software applications it uses companywide from 6,000 to 1,500. It consolidated its data centers - expensive warehouses of computers that run the company's tech infrastructure - from 85 to six. HP's own IT department shrank from 19,000 people to 8,000 - all so the company could hire more salespeople. Hurd is preaching to the IT-manager choir. HP's guests would be heroes if they too could slim down their organizations. One asks, pointing at Monte Rector, a senior HP sales executive at the table, "What if Monte wants his own CRM system?" (Customer-relationship-management software tracks a sales force's performance.) It's the kind of request these tech execs get every day from line executives who just want stuff that works. Hurd's answer drives home the message: HP has painstakingly chosen just one CRM package for the entire company, and extraordinary tech requests won't be tolerated. "If Monte wanted his own CRM system and actually did something about it, Monte wouldn't be at HP anymore," says Hurd, to hearty chuckles around the room - Rector's understandably of the nervous variety. Facility with numbers is so paramount under Hurd that even fancy PowerPoints are a no-no. Marius Haas, who runs the company's nascent computer-networking division, recalls making a presentation to the board of directors in 2008 that included a series of Harvey Balls, strings of graphic pie charts beloved by management consultants. "Mark didn't like that," says Haas, who has eliminated Harvey Balls from his repertoire. "He'd just rather see the numbers." Hurd's no-nonsense style often is attributed to a Midwestern mindset, given his 17-year stint in Dayton, the headquarters of NCR. "Mark's a rack-and-stack guy, and I am too," says A.G. Lafley, CEO of another Ohio corporate stalwart, P&G (PG, Fortune 500). "When we meet there's no chitchat or warm-up. It's right to business." The heartland motif, however, masks a more complex life. Hurd actually is the product of New York City's Upper East Side, where his father hailed from a line of Yale-educated financiers and his mother was a daughter of a physician. (She was "introduced to society ... at a dinner given for her by her parents at the Waldorf-Astoria before the Debutante Cotillion and Christmas Ball," according to his parents' 1950 wedding announcement in the New York Times.) As his father did before him, Hurd attended the Browning School - a prestigious all-boys school where classmate Jamie Dimon, now CEO of J.P. Morgan Chase, remembers seventh-grader Hurd as a good basketball player - before the family shipped off to Miami, where Hurd excelled in tennis at Archbishop Curley Notre Dame High School. Recruited to play tennis, Hurd spent his college years in Waco, Texas, at Baptist-affiliated Baylor University, where weekly chapel attendance was mandatory for freshmen. Competiveness of Hurd's variety typically is hard-wired, and the force ran deep in him from a young age. "He was one of the first tennis players I knew who grunted every time he hit the ball," recalls Baylor doubles partner and fraternity brother Carl Good. That was long before it was common for professionals to make such noises routinely on the court. "At first, I was like, 'What are you doing?' But I think it was what got him focused." Good says that although some on the team dreamed of turning pro, Hurd always focused on a corporate career. That career began in 1980, when Hurd signed on with NCR as a junior salesman in Dallas. Eight years later he relocated to Dayton for what was supposed to be an 18-month stint, but he stayed and skipped quickly up the ranks. Identified early as a team player and a marketing executive who'd make tough decisions, Hurd moved through a succession of jobs before being named NCR's president in 2001 and its CEO in 2003. "Our theory on people was that you give them responsibility," says Gilbert Williamson, a CEO of NCR during Hurd's rise. "To my knowledge, every time we threw Mark out the window he landed on his feet. So we moved him up a floor, and he landed on his feet again." NCR (NCR, Fortune 500), though a shadow of its former self today, was one of America's great old companies when Hurd joined. It had a way of doing things, he says, that prepared him for his current job. "The greatest thing I learned at NCR was discipline," he says. "We didn't have a CFO giving us a profit-and-loss plan. I had to describe my business in terms of gross margins and operating expenses. You had to be on your toes." When the call came from HP's recruiters to replace Fiorina, who'd been fired as CEO in February 2005, Hurd quickly studied HP's financials and flew to San Francisco to meet the board's search committee. "He walked in and said, 'Okay, here's your problem and here's what can be done about it,'" says Tom Perkins, the venture capitalist, former HP executive, and now retired HP board member. "And he was right. I interviewed a lot of people in that search. Mark just blew everybody else out of the water." Hurd quickly established himself as a master of organization and a stern taskmaster for accountability. He streamlined Fiorina's sales organization, reordered the reporting structure of major businesses, and ditched symbolic projects like HP's reseller deal for Apple iPods. Under Hurd, HP also has dialed up its marketing efforts, unleashing an edgy campaign around personal computing featuring cool folks like fashion designer Vivienne Tam and snowboarder Shaun White. Hurd retained two insiders, printing chief Vyomesh Joshi and hardware and services head Ann Livermore, and hired an outsider, former PalmOne CEO Todd Bradley, to run the troubled PC division. He quickly let it be known that he'd be involved in every aspect of the business, often personally reaching down multiple layers of management for tense meetings known as "Hurd reviews." HPers describe Hurd as a meritocratic martinet. "It really doesn't matter who you are, whether or not you get along with him, or what your personality is," says Ben Horowitz, who was CEO of Opsware, which HP bought in 2007 for $1.7 billion. "If you're getting leverage out of your business, he's your friend." As for those whom Hurd finds wanting, well, that's another story. His weapon of choice is the voicemail, which is more efficient than an actual conversation, and he begins the barrage in the wee hours. If Hurd is down on someone's work, he'll complain openly, so everyone knows he's displeased. "It feels like the walls are closing in on you," says one executive who has been on the receiving end. In his first couple of years at HP, Hurd kept a notably low profile, which most interpreted as his effort to be, using the term most often applied to him, the "anti-Carly." He skipped Davos, stayed off the Business Roundtable, and passed on giving keynote addresses to consumer-electronics trade shows. His big moment in the spotlight was not a pleasant one: He was grilled by members of Congress about his role in HP's use of so-called "pretexting" of reporters to find out who was leaking company information to the press. Hurd, who joined HP after the pretexting campaign had begun, insisted the practice was an "aberration." He managed to emerge unscathed, and even went on to become chairman of the board. Hurd is no shrinking violet. Privately he is gregarious, relishing in telling raucous, naughty, dishy yarns. He has a scary memory, which he's as likely to use to cite numbers from a financial report as to quote long passages from favorite movies (Animal House and Gladiator rank high) or plays from college football games that happened three decades ago. "He tells a great story," says Lars Nyberg, Hurd's predecessor as CEO of NCR and a mentor. "The only problem is that he improves the stories every time he tells them." Publicly, though, Hurd maddeningly sticks to a predictable and absolutely consistent script. Ultimately, Hurd's unwillingness to showboat has nothing to do with his predecessor. "I live by a code that I got taught very early in my career, that it's the company first, the employees second, and you're last," he says. "If that code gets inverted, it's not a good thing." As it turns out, Hurd can tell you exactly how much time he spends with employees, customers, shareholders, and so on, thanks to that spreadsheet he keeps to manage his time. In fact, he can break the "customer" category down by segment and by what portion of the "total available market" he personally has approached. The point, he says, is to be mindful of his scarcest resource. "I only have a certain amount of time to spend," he says. He doesn't read books, has played golf only three or four times in his life, and devotes the rest of his leisure to playing tennis, watching sports or movies, and hanging out at home. His customers in Phoenix were dejected that he wasn't joining them for the All-Star Game. Said Hurd: "I've got a family." Customers still feel loved, though. "He is personally self-effacing, modest, unassuming, and, I dare say, shy," says Jeffrey Katzenberg, CEO of DreamWorks Animation, which runs its digital studio on HP gear. "But you get him talking about his business, and he explodes." Hurd also is attentive. Christian Anschuetz, chief information officer for Underwriters Laboratories, says Hurd was quick to send a congratulatory note when Anschuetz took a new job. "There are people below him that are far less responsive than he is," says Anschuetz, adding, "I have two large outsourcing contracts I'm planning to put out for bid. You'd better believe I'll make sure HP gets on the list." When Mark Hurd wants to discuss a topic of some complexity, he turns to a flip chart, which aides have at the ready during any meeting. During an early February interview in the boardroom at HP's Palo Alto headquarters, the topic is HP's record on research and development. The athletically built Hurd pops up from his seat, formally buttons his navy suit jacket, grabs a felt-tip pen, and begins making lists. "Guys around here love telling me how much HP spends on R&D, because R&D is sacred," says Hurd, shifting now into a mock dialogue with an HP researcher: "'You know, Bill Hewlett is calling us from the heavens, saying, Spend more on R&D.' And I'm like, 'Guys, I'm glad Bill's calling, but I've got a few questions before we take the call.'" Jokes aside, the R&D subject is controversial at HP. While the company's labs aren't talked about with the same reverence as Bell Labs or Xerox PARC, the research arm founded by Bill Hewlett and Dave Packard gave the world pocket calculators and inkjet printers. Tech companies can't survive on operational excellence alone, but HP hasn't increased its overall R&D expenditures of around $3.5 billion for four years. As a result, R&D spending as a percentage of sales has fallen as HP's sales have climbed. Last year it was 3%, down from 4% in 2005. IBM spent $6.3 billion last year, or 6.1% of sales. In his zeal to be make HP more efficient, is Hurd gutting the golden goose? Hurd balks at this analysis as simplistic. He says much of what accountants label R&D is really maintenance spending - expenditures needed to keep up existing technology. It's this spending he's been trying to cut, he says, not pure research. To instill discipline in the researchers, he hired an academic, Prith Banerjee, to head HP Labs in 2007. Banerjee slashed scores of projects and focused his researchers on eight themes, each of which is applicable to an existing HP business. 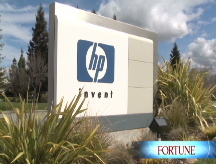 Banerjee says the boss "fundamentally believes HP is a technology company." Yet Hurd also wants results, and in some cases HP has ended up sacrificing technological improvement - and potential revenue - in favor of leanness. HP, for example, relies on Microsoft (MSFT, Fortune 500) for much of its software, but this strategy has its limits. HP was once a contender in the smartphone business, but now that business is losing revenue as Apple's iPhone has come to dominate the industry's growth. The difference? HP's phones run on Microsoft's mobile software, while Apple built a whole new user-friendly platform for its iPhone. PC chief Todd Bradley cites as an HP innovation the company's new QuickPlay technology, which lets PCs play movies without booting up Windows. Of course, if Microsoft's operating systems weren't so cumbersome, there'd be no need for QuickPlay. HP's biggest revenue gains have been through acquisitions - for example, by buying its way into the commercial printing business - but few of these deals bolster the company's innovation cred. The EDS acquisition makes HP more like services leader IBM (IBM, Fortune 500), but IBM gets a far greater percentage of its revenue from software than HP (21% vs. 3%) and makes 48% more in profits. It also commands $44 billion more in market value. Given his rack-and-stack outlook, it's unrealistic to expect Hurd to refashion HP as a product powerhouse. "What Mark is good at is helping people see what the potential in a business is and learning how to exploit that potential," says Robert Burgelman, a business professor at Stanford who has studied the Hurd era at HP. "He will not tell them, 'We should do this project or that project.' He helps them think more clearly about the space in which they are operating." Over time, though, Hurd may also need to give his employees license to be more creative, especially if he wants to close the innovation - and market-cap - gap with IBM. For now, though, Hurd gripes about the same thing he has since he joined HP: that it's still too confusing to do business with. He seems to be suggesting that the company can be simplified further, a goal made easier by the acquisition of EDS. Investors hated the deal a year ago because EDS was such a poor performer. Today HP is reaping two immediate benefits. First, the old EDS gains from Hurd's efficiencies. Second, HP wins because tech-consulting businesses are countercyclical: Companies that put off hardware purchases tend to buy more services so they can maintain existing equipment. In a November conference call with investors, Hurd said that "great companies excel in tough times, and in tough times customers turn to great companies." As the economy has worsened, Hurd is thinking more and more about HP's position - and not surprisingly, he's benchmarking HP against the competition. "The measure of great companies in this kind of environment is how you do, relatively speaking, within it," he says. "And how do you emerge stronger, relatively speaking, at the end of it?" Looking for the answers to those tough questions keeps good CEOs up at night - or at least wakes them up at 4:45 in the morning.